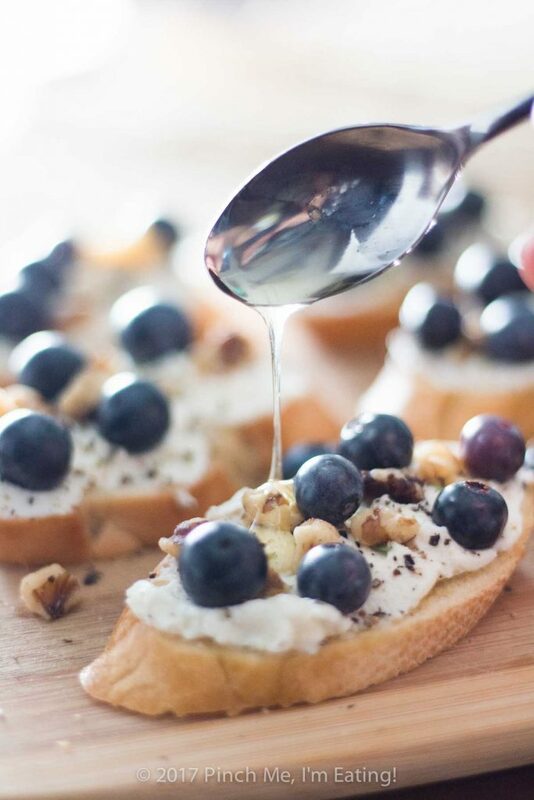 Ricotta Crostini with Blueberries, Walnuts, Thyme, and Honey | Pinch me, I'm eating! 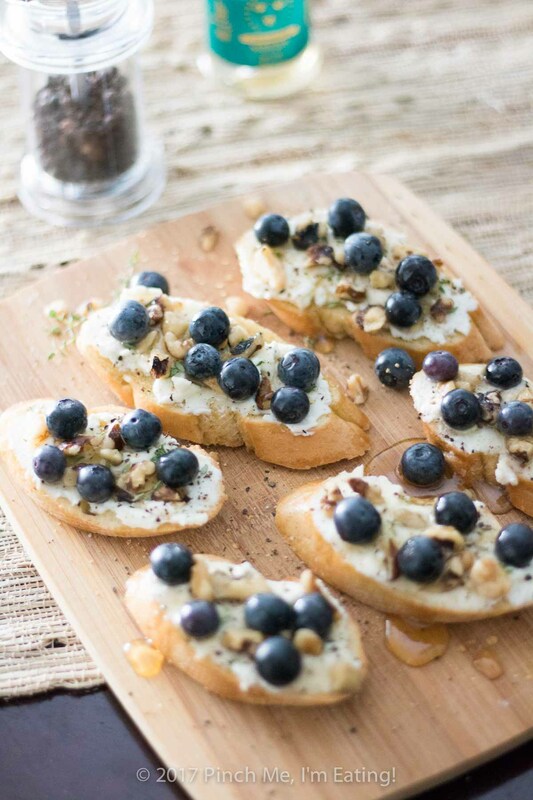 Ricotta crostini with blueberries, walnuts, honey, and thyme is an unexpected and delightful appetizer perfect for serving with wine and cheese! This is an exciting weekend! 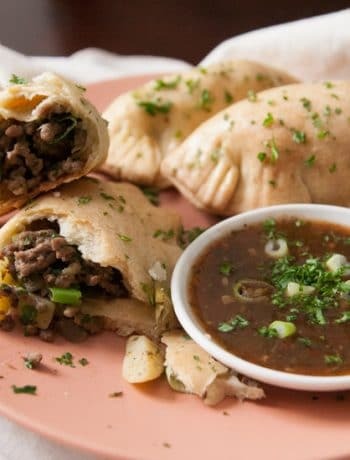 As this recipe is posting, I’m getting ready to head up to North Carolina with my sweetie for a blogger meetup of North and South Carolina bloggers. I’ve never gone to a blogging conference or meetup, and I’ve as of yet only met one of my blogger-friends in real life. David, of the wonderful and beautiful blog Cocoa and Lavender, happens to share many mutual friends, and he works at the college I went to, so we met up for wine and truffle fries when I was visiting Arizona for a friend’s wedding. We actually worked at the University of Arizona Honors College at the same time but never seemed to cross paths! 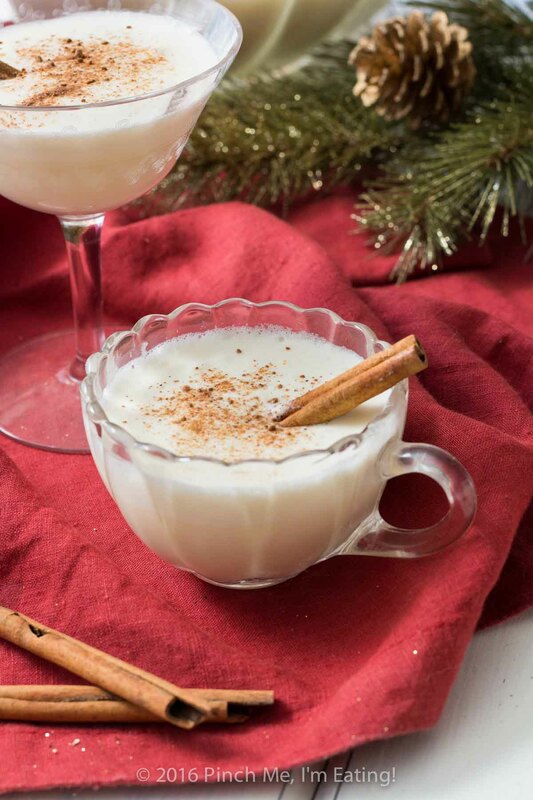 This weekend I’m looking forward to meeting Brittany of the blog Brittany’s Pantry. While David was introduced to me online via a mutual friend, Brittany happened to comment on one of my Instagram posts a while back. I saw that she had a food blog and lived in South Carolina, so we started chatting. Turns out she lives a mile and a half from my dad and stepmom! I mean, there are only about 10 people who live within a mile and a half of my dad, and half of them are relatives. Such a small world! And here we are, finally meeting after all this time, and it’s not in Charleston OR in Chapin, but in Tabor City, North Carolina. Which brings me to another reason I’m excited about this weekend. The meetup is at a little vineyard called Grapefull Sisters, and there will be wine. So Mike and I are making a little weekend trip out of it. We’ll go to the meetup, have some wine, stay at the bed and breakfast at the vineyard, and visit Brookgreen Gardens on our way home Sunday. I haven’t been to Brookgreen since I was about 10 years old, and they have beautiful sculpture gardens there, so we’ve been meaning to go for a while! But back to the wine. Besides afternoon tea, my other favorite little pleasure in life is wine and fancy hors d’oeuvres (which I can NEVER spell right on the first try. Honestly, how can I even call myself a foodie?). Seriously, give me just about anything atop a toasty slice of baguette, or a cheese board with brie and charcuterie. Maybe some pickled garlic, crackers with blue cheese and jam… I’ll take it! 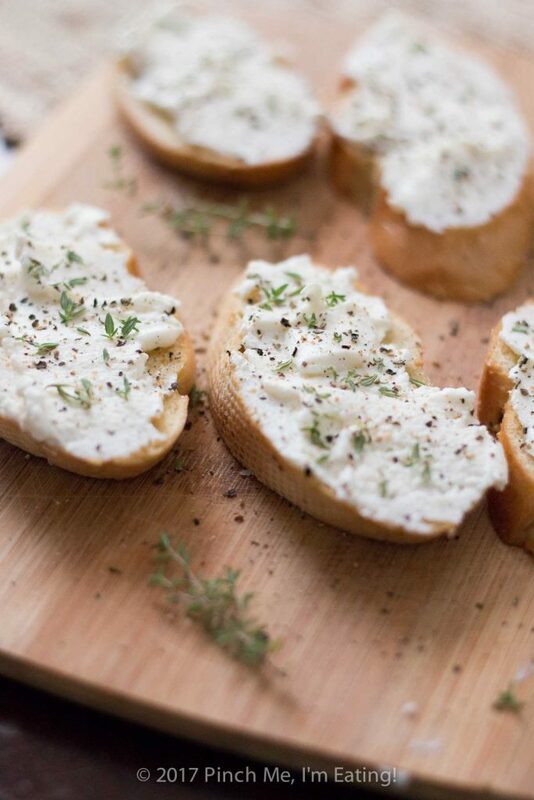 And crostini is such an easy solution for appetizers when you’re entertaining. 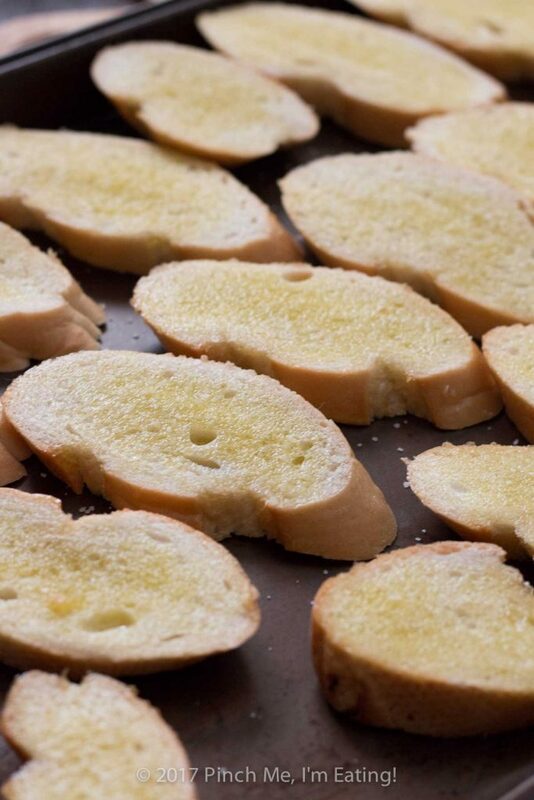 You can pre-toast some slices and top them with whatever you’d like before your guests arrive, and you can sip some wine and munch your crostini while dinner’s finishing in the oven. Or if someone’s just dropping by for a little bit but not staying for dinner, you can snack on some crostini while you chat. I can’t neglect to suggest some of these little treats as a romantic accompaniment to some wine with your Valentine in a couple weeks. Maybe some pinot grigio or pink moscato? My go-to crostini topping is a tomato bruschetta, which I’ll have to share with you soon. 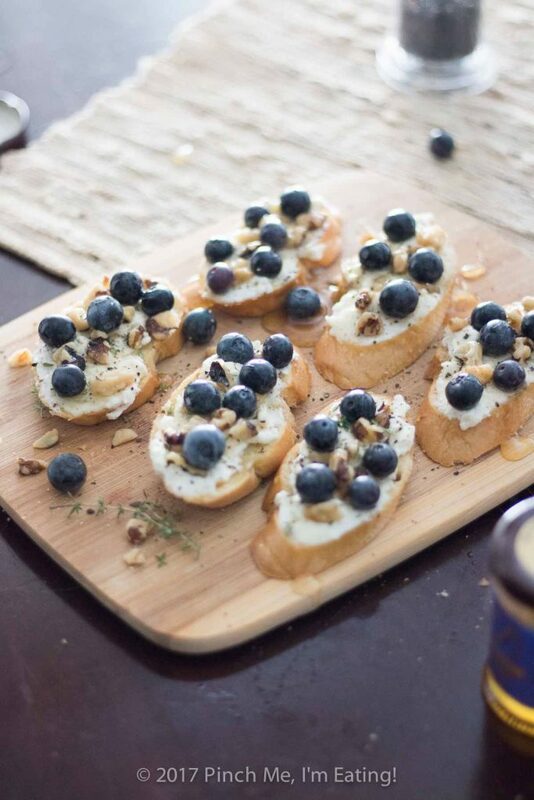 But this week’s recipe is for something a little more unexpected: ricotta crostini topped with blueberries, walnuts, honey, fresh thyme, and pepper. In the past I’ve only thought of ricotta cheese as a bland filling for lasagna. 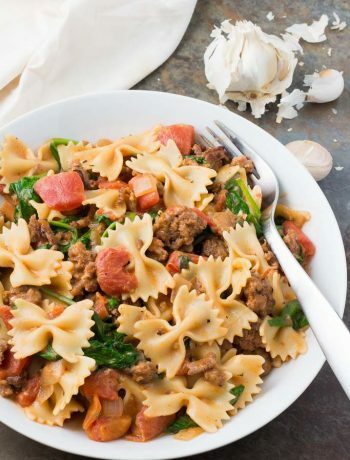 I know, I know, it’s not bland, especially if you season it with salt, pepper, and plenty of fresh basil! But in the last couple years I’ve seen the potential of ricotta cheese in so many other ways. On my friend David’s blog, he uses it as a filling for an Italian hazelnut torta filled with sweetened ricotta and vanilla-poached pears. Delicious! On this ricotta crostini, it reminds me a little of mascarpone cheese: mild, creamy, and with a little natural sweetness from the dairy. 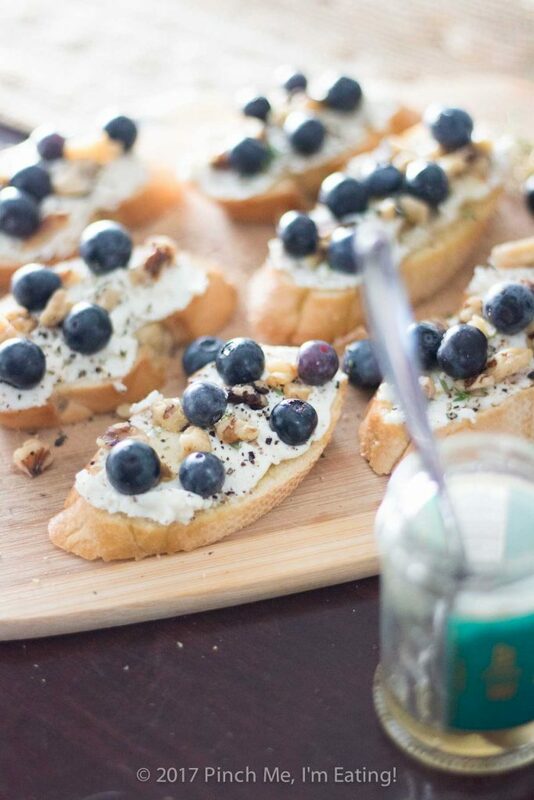 It’s the perfect backdrop for myriad toppings like this combination of honey, thyme, walnuts, and blueberries. If you can’t find any high-quality fresh blueberries, you can leave them off for a more rustic and earthy crostini, or substitute with other fruits like figs or blackberries. I bet either one of those would be amazing! You could even pick a couple different ones and serve up a variety. Yum! The honey I used was a rosemary honey from the Savannah Bee company. Rather than being honey infused with rosemary, like it sounds, this honey is made by bees that have pollinated only rosemary plants. It’s amazing how the plants the bees are around can affect the flavor of the honey! The rosemary honey is one of Mike’s and my favorites, and it was a great complement to the blueberries and walnuts on the ricotta crostini. If you have any kind of special honey this is a great recipe to really let the flavor shine! This ricotta crostini is sort of a non-recipe, since there are no specific measurements. All I can say is add plenty of fresh thyme and enough salt to balance out the sweetness of the honey. And don’t overdo the honey! Balance is key here. 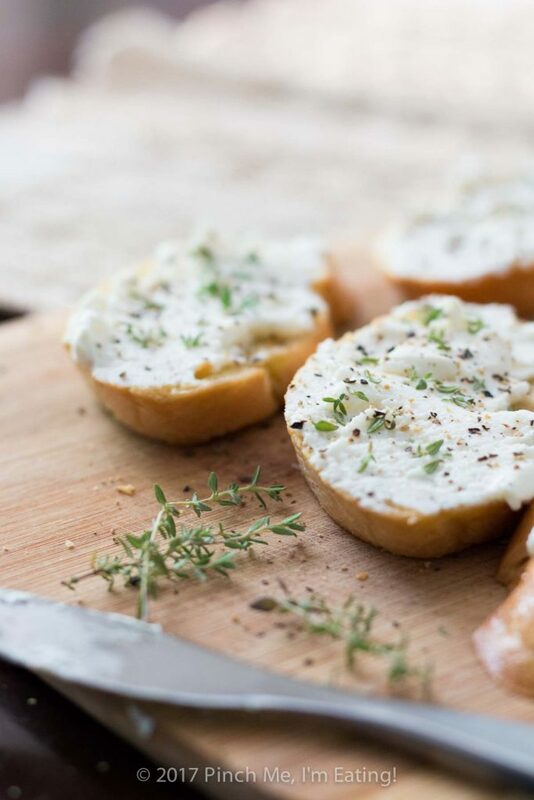 I fully expect to come home tomorrow with a couple bottles of local wine, and when I do, you better believe I’ll be making myself some ricotta crostini or other hors d’oeuvres to go with it! 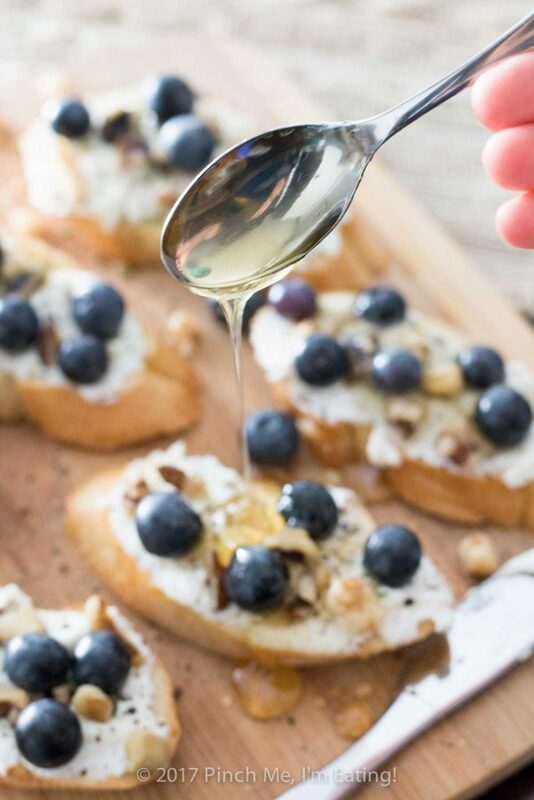 Ricotta crostini with blueberries, walnuts, thyme, and honey is an unexpected and delightful appetizer perfect for serving with wine and cheese! Preheat oven to 375. Slice French bread on the diagonal, about half an inch thick. 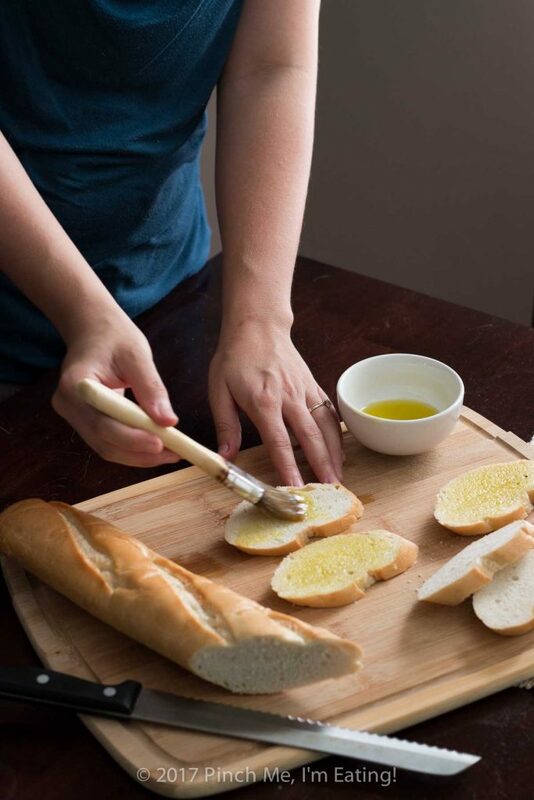 Brush one side of bread with olive oil and sprinkle with kosher salt. Arrange on a baking sheet. Bake for 7-10 minutes or until lightly golden. Don't overbake — you're making crostini, not crackers. Spread each slice with ricotta cheese. Sprinkle with black pepper and fresh thyme. Press in some walnuts and blueberries. Drizzle with honey. Add additional salt, to taste. You can leave out the blueberries if they aren't in season, or substitute figs or blackberries. 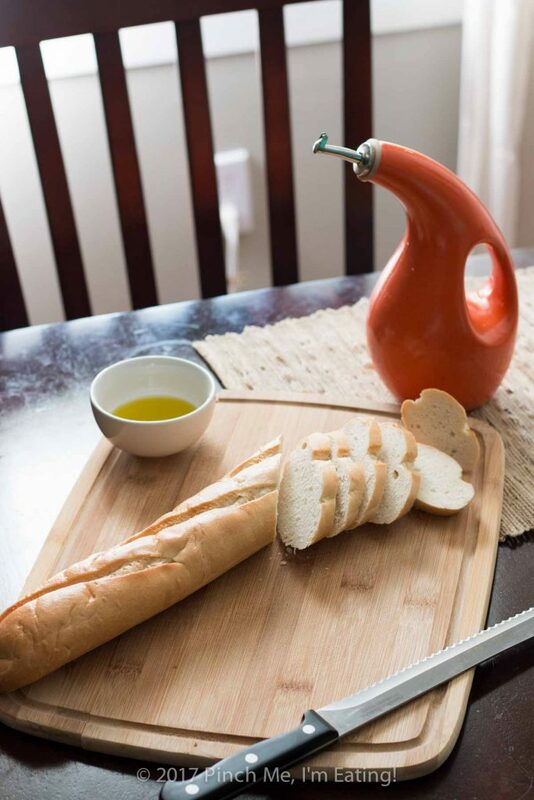 The crostini look amazing – what an unusual combination of flavors. Thanks so much, David! I’m curious about what the shoutout is going to be in March — I WISH I could plan my posts that far in advance, you’re amazing! We had a great time at the meet-up and wine tasting! Thanks for your well wishes!